Knowledge management presents a new way of understanding organizations and companies, and is especially suited to sophisticated and highly technical firms and operations such as those in the construction industry. This new book draws on hard data from three separate research programs in Sweden and shows how the concept of knowledge can make sense in the construction industry, an industry which can be viewed in essence as being engaged in the material transformation of "nature into buildings". In particular it explores and examines three different businesses: a medium sized construction firm; Wingårdh Architecture, Sweden’s most prestigious architecture firm; and BESAB, a specialist concrete injection firm working on underground construction. 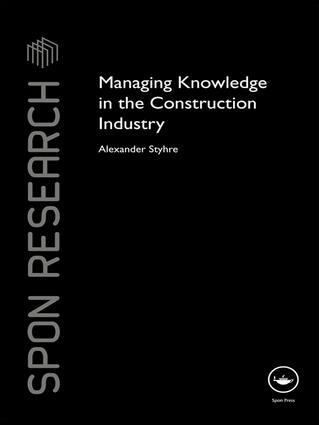 An emerging theme is the situational and context-bound nature of knowledge in the construction industry, thus showing "knowledge" to be a remarkably heterogeneous concept. A range of readers should find the book useful, from students and construction managers through to researchers.